Kleefeld on Comics: On -isms: No Lobo? 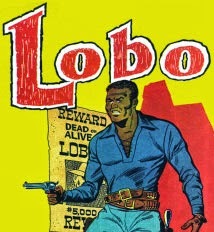 I've talked before about Dell's Lobo from 1966, and how it featured the first Black character who had the comic named after him. In that previous post, I included scans of the first issue and linked to where you could find scans of the second. So it's available to be read. But I'm wondering... why hasn't it ever been reprinted? I mean, this is a significant comic -- why hasn't it been reprinted? Is it just a legal issue surrounding who owns the rights? Unlike many of Dell's comics, Lobo featured an original unlicensed character and there's no copyright notice to work with, so the question of who legally has the rights to the story seems unclear. In theory, it would remain under copyright until 2061 (95 years after the date of publication) but with no visible copyright notice...? My guess is that no one has deemed that the expense of even just sorting out the rights would be made up for by the reprint sales that might be generated. Which means that either A) we'll have to wait another half century to see it published again, or B) someone will gamble that whoever the copyright holder actually is won't take any legal action if it's published without their permission. I daresay the latter is a distinct possibility; I've seen similar stories reprinted in this manner. It seems like an important issue that should be celebrated more than it is. But I suspect people downplay its sale-ability precisely because of the main character's skin color. And they'll claim it's not racist because it's just that sales wouldn't be very good, not realizing that the the biases that led them to that conclusion stem precisely from a system that discourages readers from seeing Black protagonists as worthwhile. And that's why projects like Black need to work outside the usual publishing system to really get going. "In theory, it would remain under copyright until 2061 (95 years after the date of publication) but with no visible copyright notice...?" Pre-1976 copyrights had to have three things done to actually establish copyright. 1) Correctly-written copyright notice visible in the book/magazine itself. 2) Two copies sent to the Library of Congress. 3) Paperwork filled out and sent (with fee) to the Library of Congress. Leave out or screw up any of those steps and the project (book/magazine) is Public Domain. Unlike present law, there was no automatic copyright. Hmmm... I'm half-tempted to try to reprint it myself. I'd have to track down some good copies to get some high-quality scans, but that would be feasible at least. Except for, you know, the lack of time to get done everything else that I'm trying to do! :) Thanks for the info!